A teacher who became embroiled in a county lines drug operation after her marriage broke down has been jailed. 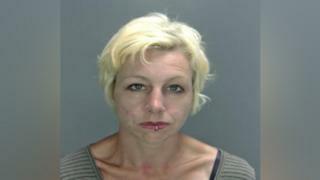 Angela Davey, 38, of no fixed address, was living in Norwich when she became addicted to drugs. The mother-of-two said she turned to heroin to "numb some of the pain I was feeling at the time". Davey hired vehicles for a drugs operation, and allowed her home in Wall Road, Norwich, to be used as a base, Norwich Crown Court heard. She pleaded guilty to conspiracy to supply class A drugs but in court denied she was a dealer. Prosecutor Richard Potts said Davey "had an important role in the context of the case" and was "entirely aware" of what the vehicles would be used for. He said a Vauxhall Mokka she had hired had been used for dealing in Heathgate in Norwich on 8 April 2017, and a Citroen hired from Norwich Airport on 25 May was driven to Waltham Forest in London to collect drugs. Mr Potts said she was not a victim of cuckooing - in which a drug user's home is taken over against their will by a dealer. He added she retained "some degree of control" of who came and went from her home, even charging them rent. The former teacher denied receiving money from drug sales but confirmed "rent" was paid to her in the form of drugs to feed her habit. Andrew Oliver, mitigating, said until 2016, the mother-of-two had been leading a "relatively model lifestyle" but "tragic circumstances" had led to the break-up of her marriage and "ultimately led to her use of crack cocaine and heroin". Davey wrote a five-page letter to the judge to explain what had happened and how she had since taken steps to turn her life around. Mr Oliver said Davey had suffered "extreme distress" from not being in contact with her two children. She was living an "itinerant" life on the streets of London when she was arrested but had since begun to overcome the effects of drug withdrawal. On sentencing her to 27 months jail, Justice Katharine Moore said "as an articulate woman" she could have sought support for her addiction instead of being "drawn into the shadowy world of drugs". Three other people involved in the supply of class A drugs were jailed in January.